ValueLink Appraisal Management Software gives appraisal management companies (AMCs), lenders and appraisers the ability to manage and track all their appraisal orders from a single location, while maintaining regulatory compliance. The system is completely cloud-based and can be accessed from any location and on multiple devices. 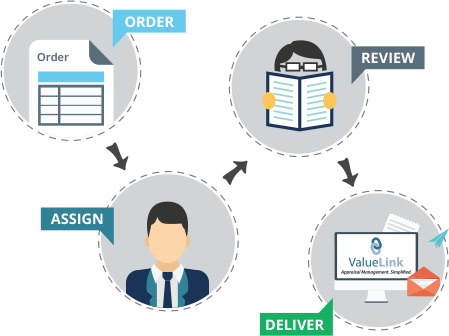 Incorporating a host of powerful features, ValueLink becomes the hub of your appraisal management processes, enabling you to deliver value to your clients. With years of experience working with appraisal management companies, lenders and appraisers, we have developed a robust appraisal management software which is flexible enough to be aligned with your business goals and objectives. Not only do our customers gain operational efficiencies, they save thousands of dollars in the process. It’s no coincidence that they have great things to say about us. ValueLink appraisal management software was designed to simplify management of all aspects of the appraisal process and maximize the efficiency of your business. That’s why all ValueLink customers get all the appraisal management features right of the bat. With ValueLink, you can manage both residential and commercial appraisal orders and track every step of the way, from order creation to the final delivery of the appraisal report. The system also features comprehensive vendor management, reporting and accounting features to make it the hub of your appraisal management. We have also partnered with the most innovative companies to incorporate a host of additional features including, but not limited to, LOS integrations, Automated Valuation Models (AVMs), Automated Appraisal Reviews, Submission to the Uniform Collateral Data Portal (UCDP) and Quickbooks Synchronization. ValueLink is a step up from the rest. The flexibility of the software support team to work with us on adding/changing the features of the system has been great. ValueLink has been great to work with. They have a great and simple appraisal management platform which makes it very easy to work with and yet be compliant. On top of it they have great customer service. Sam Heskel, Nadlan Valuation Inc.
We were able to tailor ValueLink appraisal management software to the exact needs of our clients and our staff. It is a cost-effective, fast and efficient platform that stands out among its peers.